Fat Daddios muffin pan series are built from 18 gauge anodized aluminum and feature a rigid rolled rim that creates a very durable pan. The anodized finish promotes even baking and easy release and cleanup. 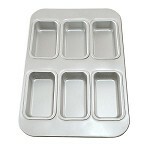 With 8 styles, we offer everything from the standard muffin pans to our best selling square muffin pan.